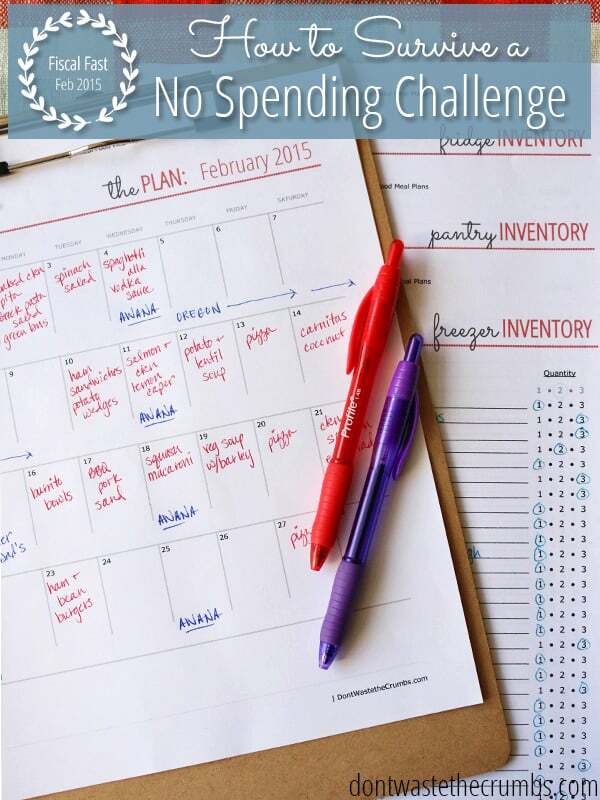 Last August we embarked on a challenge where we spent zero dollars for 30 days. We learned SO MUCH from that challenge – both financially and personal growth – that we wanted to do it again and we wanted YOU to do it with us. You received the official invitation a couple weeks ago, as well as the rules of the game, and if you’re joining us in the challenge, today marks day 2. If you haven’t committed yet, it’s never too late to join! With only one full day under our belts, it’ll be too early to tell how the rest of the challenge will pan out. But I can tell you this: Mr. Crumbs and I have a clear plan of attack in order to make it through the month without spending any money. 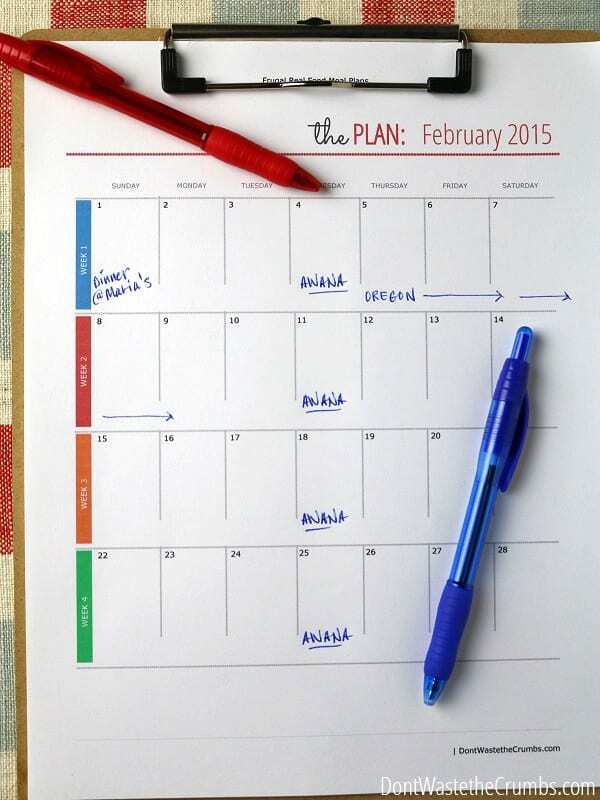 Benjamin Franklin is the one who quoted, “If you fail to plan, you are planning to fail,” and his advice couldn’t ring truer when you’re looking at 28 days of not spending a dime. I mean, the thought alone is daunting… but then to face the challenge head on without any plan in place?! We all know that’s just a disaster waiting to happen. There are mouths to feed, places to go and obligations to follow-through on. One of the lessons we learned from the first time is that the only way to successfully make it to the end without a mass panic ensuing is coming up with a game plan from the get go. But how do we do that? Where do we even start?! Anytime you tackle a goal, whether big or small, you always start with what you already have and what you already know. So let’s start there in creating a fiscal fast survival guide. Yes, this goes for food, but it’s so much more too. Remember that the rules state you can’t buy ANYTHING unless you earn extra income – above and beyond your normal salary – to pay for it. Taking inventory of your kitchen is definitely a great start, and I highly recommend doing that, but consider what you normally buy for other areas of the home too. How much do I have right now? Will it last me the rest of the month? Can I go without it? If I have to replace it, how much would I need to make it through February? The goal of the challenge isn’t to deprive you of the fun things in life, rather to cultivate true thankfulness and content in the things we already have. At the same time, you don’t want to run out of toilet paper on day 5. We’re talking doctor appointments, birthday parties, work, school, church… places you have to drive to, field trips to take, events you have to contribute to, or gatherings you’re hosting at home. It’s best to be fully aware of what your calendar contains, so that you don’t accidentally find yourself in a bind later in the month. Can you image the predicament you’d be in if on week 3, something you’ve committed to is 50 miles away and you’re down to just two ticks of gas? It would be so much better to know about that up front, so you can either ration gas accordingly now, and attend the event later, or perhaps reschedule the event to next month when the fiscal fast will be over. Or another idea – change the location of the event so it’s closer to home, or even at your home! How many miles do I have to drive this month? Can any of the trips be combined? Eliminated? Is it absolutely imperative that we attend this activity? Or can we miss it? How many meals are we eating at home? Do we have any commitments we have to bring food to? How many people will be coming over this month? And for what type of activity? We certainly don’t want you to feel like you can’t go anywhere or invite anyone over during this fiscal fast. We just want to point out the obvious – that you won’t be able to drive to work AND take the kids to school AND go to church AND drive an extra 100 miles when the car is running on fumes. Think ahead, and be prepared. If taking inventory was step 1, and looking ahead was step 2, this step is the bridge connecting the two. 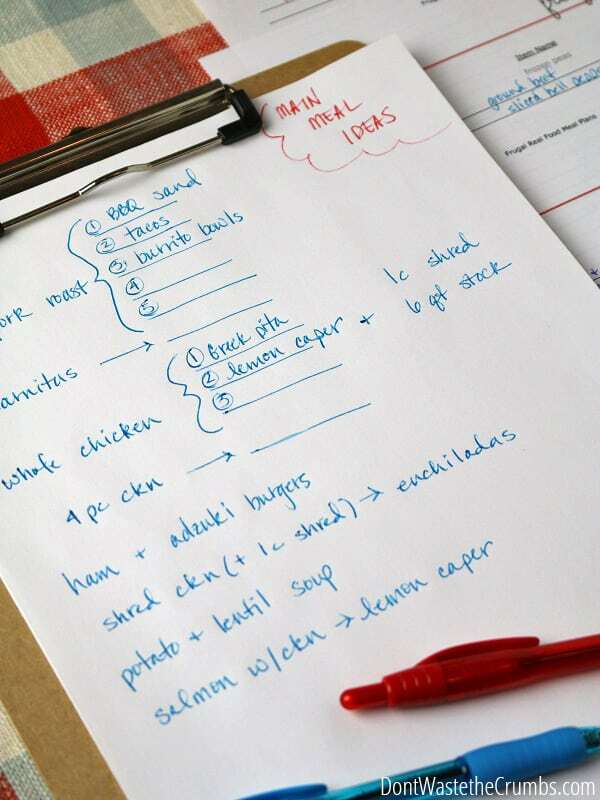 This is where you meal plan, and strategically place your meals so you don’t have to eat rice and beans every night for a week. Where you consider making a dozen pancakes with just two eggs over scrambled eggs for just one person. This is where you scour frugal recipes to see what you can make with just potatoes and frozen corn. To see what delicious dish can be made with only a bag of frozen vegetables. Think about all the places you’re committed to be and see if you have enough gas to get you there. If not, figure out how many miles you’re short and seriously consider skipping an event, or finding another creative way around the problem (see step 4 for more ideas on this). This is where you prioritize your needs, if or when the times comes and you’re forced to make a decision between gas in the car or toilet paper. This bridge will also help you see how aggressive you need to be with making up the difference between 1 and 2. Depending on how far your 2 is from your 1, you might have to get pretty creative with making ends meet. Remember that you can sell things, work odd jobs or whatever else you can think of to earn extra income above and beyond your normal salary – to help you out this month. But there are other options too, if we think outside the box. On their behalf, they were just curious if it was even possible, and why we would want to do that to ourselves. But to us, it WAS awkward, and I’ll admit – we questioned ourselves more than once if we were simply being way to extreme (something we’re known for). However, by the time we had completed the challenge, our outlook on what we needed versus what we wanted had totally changed. Our hearts were so content and we no longer desired wasteful, frivolous things anymore and focused on how we’d already been blessed. And those questions our friends kept asking us? We were thrilled to answer because our perspective had changed so much! 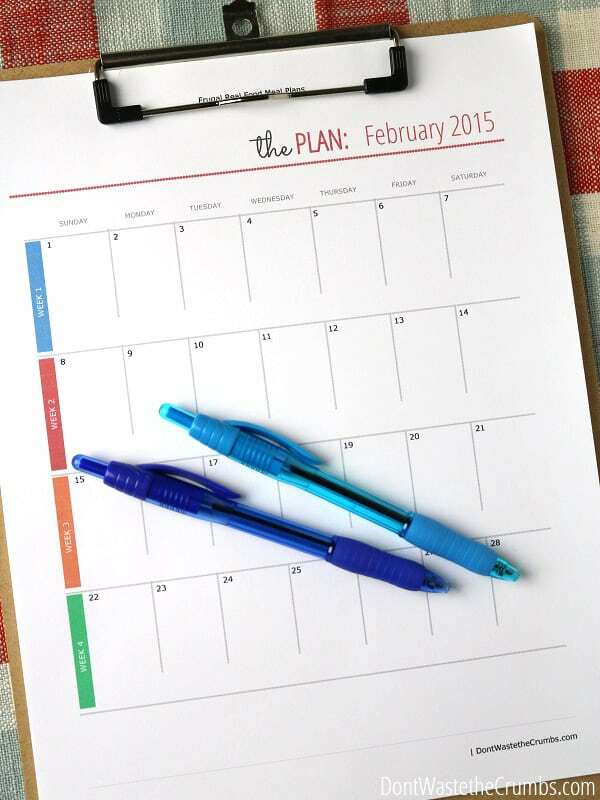 For those who have joined in the challenge, did you create a plan of attack? What difficulties do you think you’ll run into? How do you plan to overcome them? I’m impressed by how well-thought out this is!! However, I’m still a little too scared to participate. 🙂 I’ll be cheering you on from the sidelines! Hi Bobbi! There should be a big grey box in the center of the page with a blue “download” button. Enter your information, click the button and it’ll be emailed to you! Bobbi! I’m so sorry! That’s fixed now. Thank you for telling me!!! I’m all ready for this… Then realized last night that I have about 1/8th of a tubes of toothpaste left! Then I thought hard for alternatives. … And discovered that, besides using baking soda, I have several sample tubes of toothpaste I can use up. They are probably in need of being used anyway. So, first crisis averted! I am behind here, so I definitely wouldn’t start this still at least tomorrow. 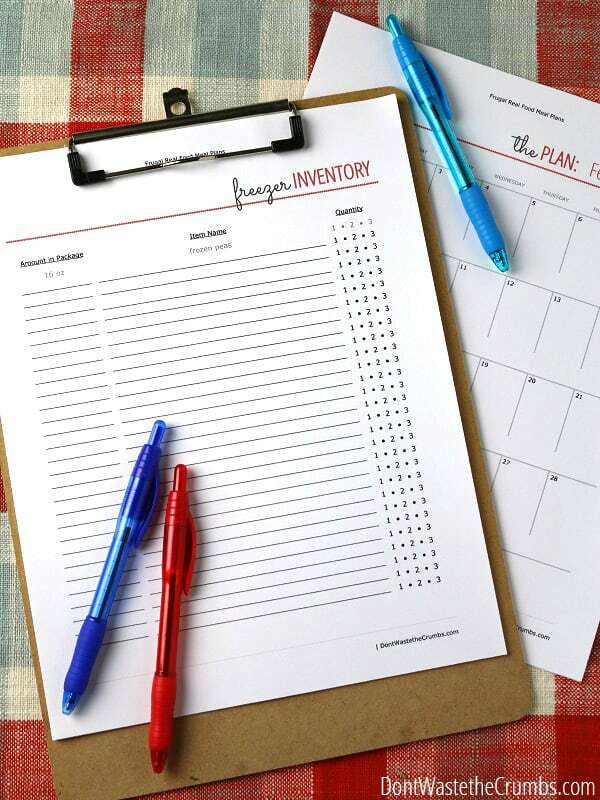 Need to inventory, but the meal plan is actually in place for the next two months ’cause I made it my Ultimate Goal for the year to get them planned. Plus I wanted to see how few times I could run to the store. My only problem with this sort of challenge is that I have two heavy milk drinkers (both teenage boys) and storing 24 gallons of milk in the freezer or fridge is just not possible. (Well, possible, but not feasible.) So regardless there would be either a weekly or biweekly milk run. I’ve thought about trying to stretch their supply with dry milk, but I’m a little worried how that would go over. Actually I did just discuss it with the 15 year old and he’s game to try out a couple things but he’s the easy-to-please kid anyway. I’ll have to discuss this with the Man/lings and see if they’re up to the challenge! I love that you’ve challenged yourself NOT to run to the store, lol! We talked about the milk issue too here, and decided to make non-dairy alternatives (coconut milk mostly) for all cooking purposes, and then that will become our creamer too when we run out. Maybe cutting it back just a little bit with alternatives could help you stretch the milk? This sounds like a great idea but very challenging. We won’t be doing it this month because we already had a long road trip planned for most of the month which includes a brother’s wedding, but maybe sometime. I don’t think the food and household items would be too hard for us because we really don’t shop for those items very often anyway. But gas would be hard since we live 25 miles from town and there is nothing within walking distance 🙂 Also we have our own business which we run from our home. How would you deal with business supplies? Selling extra items for spending money would also be challenging since currently we count all that kind of thing as part of our income(we don’t have a regular salary, it is all what we grow, make and sell and it varies by month and season!) Thanks for the challenging ideas and also all the frugal tips on your blog! Hi Celeste! I would definitely categorize business supplies as a “need” – but try to only buy what you absolutely have to. Even though you’re not joining us this time, you can still cut costs on your trip by packing food and limiting your driving when possible. Good luck and have a safe trip! Hello Tiffany. Just wanted to say I admire your commitment and resolve. I have been following you for a while but never commented. I have learned many things from you that helped me greatly with our budget and just wanted to say thank you. I Would love to try something like this, but my husband would be really hard to convince. Maybe one day. I will be following your journey and taking notes on the things I can implement. Cheering everyone on! I have a suggestion for Stacey and her milk dilemma. I had a similar situation when we started our switch to an organic whole foods diet with my girls. They used to drink 4 gallons a week of 2% milk. Could not afford to continue consuming the same amount with organic milk, so I started buying whole milk and diluting it with water . 2 cups of milk to 1 cup of water is very close in consistency to 2% ( 1 :1 ratio for skim milk) . They never noticed the difference and neither did their friends! Hope that helps. Gwen, thank you for such a thoughtful comment! You made my day! I’m glad that Crumbs has been a blessing to you and your family! Love your whole site! It’s a treasure trove. I found you last night when looking for a facial wash and was drawn in. I have 100 dollars a month to spend on groceries and household items and I am very frugal. I am mostly vegan I don’t allow meat into my house for phobic germ reasons…haha, and don’t like dairy (except cheese) which helps keep my costs down. What I was wondering about (for this challenge) what you do about your ‘fresh’ veg and fruit? I went shopping today before reading about the challenge and spent 60$ stocking up on all the items I would need to make my meals for the month thinking I would just run to the store weekly for fresh fruit and veg salad fixins, but now I want to try the no spending challenge but what do you do about fresh stuff? I immediately felt like a pirate when you said “treasure trove!” Thank you!! Fresh veggies and fruit: We had a pretty good supply before we started the challenge, so we had a little bit of time before desperation kicked in. In order to get fresh fruit and veggies though, the rule is to sell something in the house (that we don’t use anymore) to fund basic necessities. Welcome to Crumbs Plastraa, hope to see you around! I’d love to try this July 2016. Is that too late, also I have 13 year olds birthday to think about. She’s not that into the challenge nor is my six year old. Lol. It’s never too late to start Gloria! For the kids, tell them up front what you’re doing, what the goal is and that it’s a short-term thing. 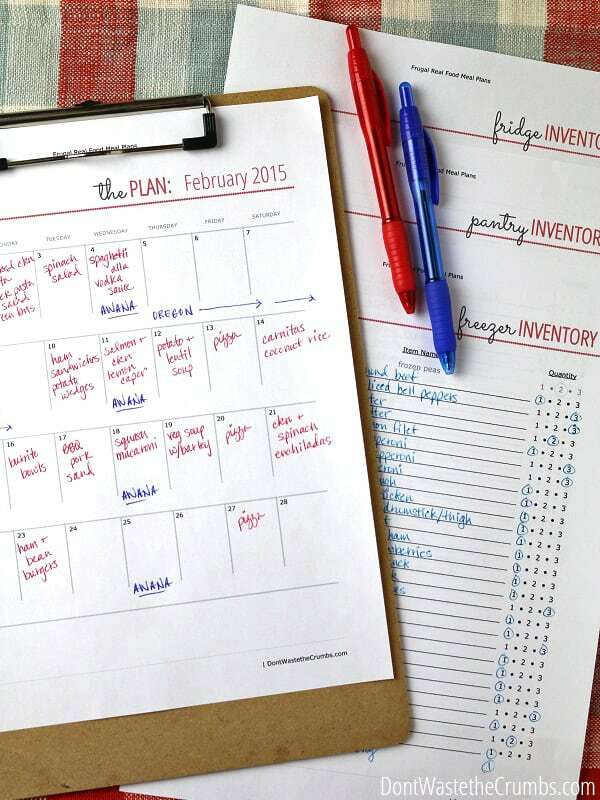 Put an end date on the calendar and let them help you think outside the box for creative ideas to not spend money. Anytime they complain, gently remind them again of the goal. We found that it took a few times of explaining before the kids caught on to the fact that we weren’t spending money, lol. And I gave them options frequently – like you can have toast for breakfast OR lunch, but you can’t have both because we have other food to eat too (toast might be a bad example, but it works for when you don’t have much of something they really like). I like this idea and would love to try it. However, we live in a rural & economically depressed area where selling things via Craigs List, etc just doesn’t work. My husband drives 52 miles to work and back each day. I just don’t see a way around not needing to buy gas. Other than that issue it should be fairly straightforward to achieve this. I may go ahead and do it with the caveat thay buying gas to go back and forth to work in his car is allowed. But it will have to wait at least until March as I have already committed myself to activities that will use up more than 1 tank of gas for Jan & Feb.
What would you do about unexpected medical expenses or other emergencies? (Such as the furnace quits working, etc)What about monthly bills, insurance, rent, utilities? Typically during a no-spending challenge, you assume that there won’t be any crazy unexpected emergency. Depending on what it is, it’s up to you if you want to pay for it or not. It’s not necessarily the “law” that this challenge is for, but the heart behind it. If you can go without the furnace working, then great! But regular expenses (i.e. bills, rent, etc.) should definitely be paid. I’m not suggesting getting in financial trouble here! We’re not doing a fiscal fast but this series really helped me as our next paycheck is coming soon and our budget is $255 for that month (including food, household items, cleaning products etc) for two people with IBS and several severe (and many less severe) allergies as well as being vegetarians. This will include a trip away for a week for my partner as well as having company over for a few days and a birthday party. Our usual budget is about $760 but we regularly end up around $900 (to be fair, the minimum a family of 2 should spend for two people – for the lowest income families – is something like $700 according to the government consensus who gives out social benefits etc so we really aren’t splurging that much. We just, and I mean literally, live in one of the most expensive countries in the world when it comes to food. Thankfully food prices are high because paychecks are as well so it tends to balance it all out for most people, though people spend more % of their income on food here than almonst any other western country). 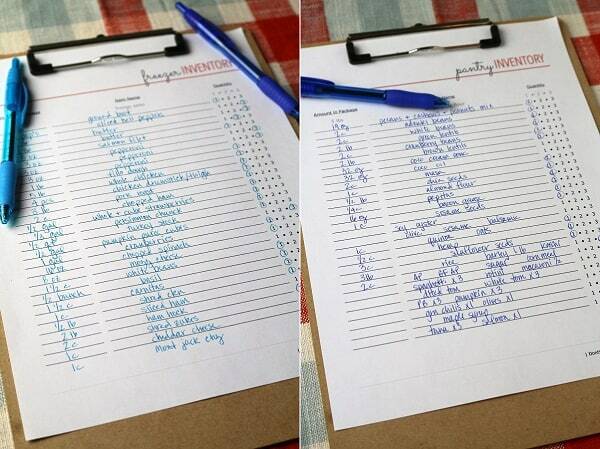 Anyways, this was a real help when making a monthly food plan and going through all kitchen inventory. Thank G-d we have enough beans to cover the whole month as that’s one of our main staples that we both need and love. We’ll see how it goes. At least we’re motivated to making it work. Thanks for being a support in our financial journey without even knowing us!